With the best of intentions, Google had launched a unique contest to create better and detailed maps of India called Mapathon 2013. The event started on February 12 and ended on March 25, 2013 wherein Indians were invited to add details regarding their local maps. 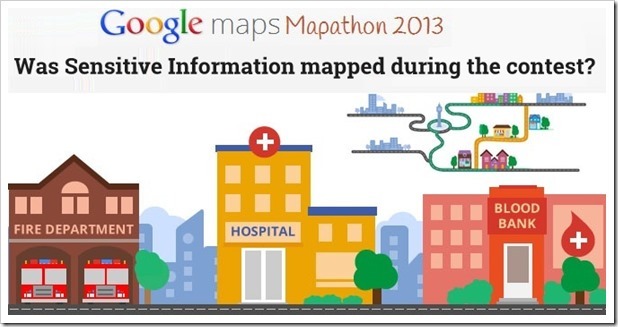 Focus was on mapping more hospitals, restaurants and hotels into the central repository of Google Maps. After more than a year of this contest, Indian Government has realized that this contest of mapping India was illegal! Surveyor General of India’s office has lodged a complaint with the Union Home Ministry, which has asked CBI to initiate an enquiry into this fiasco. As per the allegations, Google has violated Indian laws by mapping sensitive areas and defense locations, which should have been kept as secret. Infact, the areas which were covered in this contest, which resulted in them being added to the maps of India as showcased on Google Maps was never intended to be included in any map, due to the sensitivity of the locations. Some analysts have said that this mapping of prohibited areas of Indian defense may lead to terrorist activities and this action has put the lives of our soldiers in danger. Another allegation which has cropped up includes permission of mapping itself. As per the Government of India law, Google should have taken due prior permission from Survey of India to carry forward this contest, but it seems no such permission was asked. CBI is in talks with Indian Army to collaborate this investigation, as most of the ‘hidden’ areas which were mapped belonged to them. Survey of India, which is India’s national Mapping and Survey Organization under Department of Science and Technology has also asked Google to provide all the co-ordinates and details of defense establishments which have been mapped as a result of this contest. The locations and co-ordinates of these locations were supposed to be out of public domain. We will keep you updated as the investigation by CBI unfolds. Xiaomi Mi3, A Real User Review! They should compare Google Maps with ISRO’s Bhuvan and learn how to make good, usable maps first and then go witch hunting.